Thank you so very much Mr. Lefebvre. 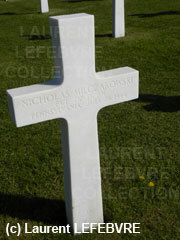 I am honored that you posted this in my Uncle Nicholas' memory. I hold dear any memories or items I can find about my Uncle. I found references in two books recently and I was thrilled (and saddened and proud) at the same time to learn more about how he died.